You can always tell if someone is really from Toronto by asking them to pronounce “Spadina”. I won’t give away the secret but you will only know how if you actually know how. I have had these pictures sent from another friend from those long lost days, David Klug, who I have known almost as long as David Kwinter who sent me the photos of Toronto in the 1910s. But these photos of Spadina Avenue take me right back to the very neighbourhood I grew up in. 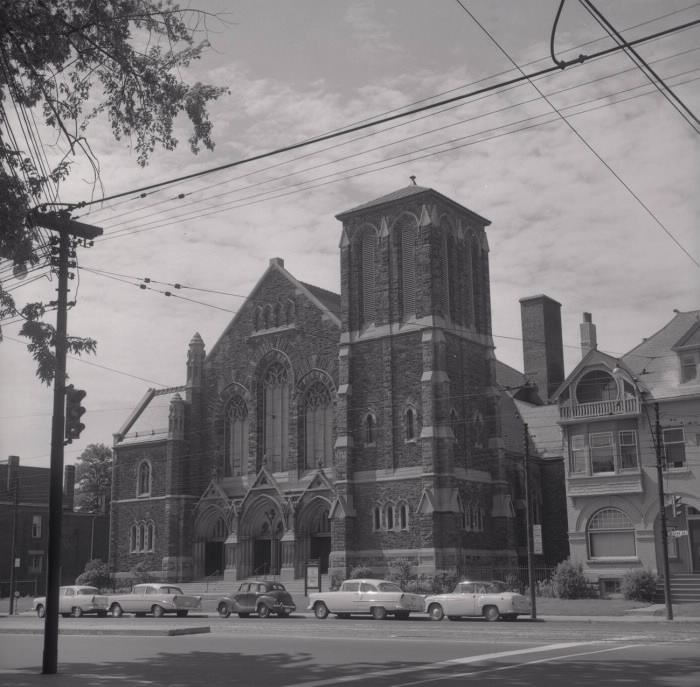 The first of these is of Knox Church, where I was sent to nursery school ages 4-5. I genuinely do attribute my Presbyterian take on life to those days. I am a firm believer in give me the child for the first seven years of his life and I will give you the man. They only had me for two of those seven, but they did make a difference. The picture is from 1956 when I might have been right there when the picture was taken. 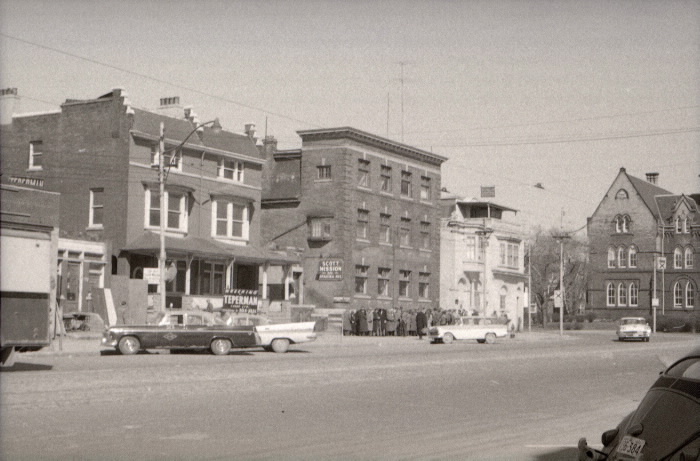 There is then the Scott Mission around 1960. If you continue left around the corner you will come to my first grade school, Landsdown Public (which was also my parents’ school), so I knew this place very well. And if you look really really close, you will see the queue of people who used to line up outside the building each day, since it was a charity whose mission was to feed the hungry. Always and only men, but always a line that stretched more than the length of the building. A very working class area, but not something I have ever really thought about since it was also home. 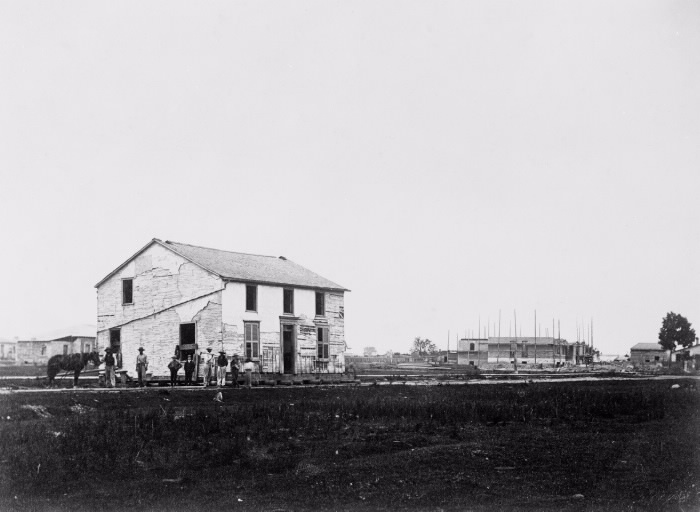 It’s a shame they don’t have pictures of the old Borden’s Dairy building which was also on Spadina, and just across the back fence from the house I lived in. Today where I lived would be seen as undesirable – a manufacturing plant just outside your back door – but I thought of it as wonderful, a real adventure playground. The last picture is College and Spadina in 1870. I guess there had to be a time when there was nothing there, but it is astonishing to realise how relatively recent that time was. My grandfather used to tell me how he had run into the Two Boys from College Street (“the tzvei boy-es fin College Street” – accent supplied upon request) and what they had been up to. Really, only now as I write, do I appreciate how inventive he must have been since undoubtedly every one of those stories was a story he made up himself to tell me. Life is short. These pictures are an entire lifetime away from me now, but I remember them like yesterday, better than yesterday.